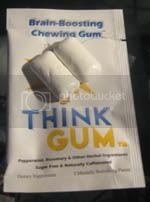 ThinkGum is a sugar-free caffeinated chewing gum. Caffeine is from guarana seed and the gum also contains extract from Ginkgo Biloba. 20mg of caffeine per serving (serving = 2 pieces of gum).